Today we are reaching all the way back to 2010. That was a particularly good year for music as numerous bands put out great new albums. Somehow lost in the shuffle was an obscure Swedish band called Rising Shadows. I was fond of this band's previous release, "Found in the Cold". That was a surprising discovery for me, as I wasn't certain what the genre had in store, let alone the band. I had been toying around some with this genre before discovering Rising Shadows, but with the genre in question, you really do have to listen to a few songs to get a feel for whether or not you will like it. 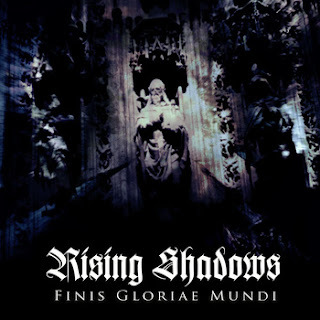 What kind of music exactly does Rising Shadows record? The easy answer would be neoclassical darkwave, but of course it is never that easy to describe a band. Rising Shadows performs contemporary music that successfully blends the use of classical instrumentation with more modern approaches to Western classical music. In addition to the varied instruments, vocals are a minimal mesh of Enya-like singing and alto arias. This is a welcome addition to the music of Rising Shadows, but one that causes some concern. These vocals are good, but not great. When overused, they can become repetitive and boring. Luckily, these vocals are minimal and less-pronounced. It is notable that Rising Shadows, as well as many other bands from this genre, employ the use of archaic percussion, which presents a medieval quality of sound when used in conjunction with the vocals. This is where the music gets really interesting. It is very understated and very different than most film scores, not to mention conventional neoclassical music. The result of all this innovation and rehashing of ancient techniques is an enjoyable listen that can also serve as a reprieve between listening to classical and more popular styles of music. Neoclassical darkwave is a genre few bands dare to delve into because it is so risky. To pull this off, a band has to have a love for music that goes far deeper than simply scanning the radio dial to discover new sounds. Rising Shadows is, in my opinion, one of the best neoclassical darkwave bands in existence. Their melodies are easy to listen to but not so catchy that you find yourself humming it while working. Indeed it is music you really have to listen to. In that regard, you are in luck because we have the full stream via Rising Shadows' bandcampe page below. This is a free download, so if you like it you have nothing to lose. Thanks for reading and enjoy!